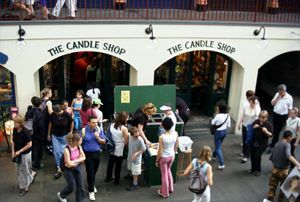 i We opened Britian's first candle shop in Camden Town in 1971 and it then moved to the Piazza in Covent Garden in 1981. Sadly with the congestion charge and high rent and rates it was no longer viable and closed in March 2004. However, we sell an even larger range of candles from this site. Our other shop at the junction of New Kings Road and Parsons Green Lane sells general gifts and candles in bulk. You can buy candles from it at greatly reduced prices. Web orders can also be picked up from here by arrangement. The address is:- 50 New Kings Road London SW6 4LS Tel 020 7736 0740. It is 2 minutes walk from Parsons Green Tube and on the No 22 Bus route. You will be amazed at our HUGE SELECTION & our LOW PRICES over 1000 lines with a vast selection of Candles of all kinds, a huge array of Candle Holders & a full range of Candle Making Supplies, Formerly situated in the basement of the Piazza in London’s Covent Garden. The most comprehensive candle site in the UK. Browse our selection of genuine bulk buy discount on both candles and candle holders. Wholesale candles to the general public! We are always happy to accept telephone or e-mailed orders. Please do get in touch if you have any problems with the site or if you would like advice. If you need any help finding something and cannot find it on our site PLEASE ASK! - we may well be able to help. Also worth a visit is our GIFT section which now features many items not related to candles but which we stock in our UK shop in Fulham. In addition to cheap jokey presents, we have a great selection of men's presents clocks, picture frames and stationary items. Our PERSONALISED CANDLES start from £1.39 and make perfect wedding favours. NEW this year - personalised candles with Jewish, Chinese and Hindu motifs. Also for weddings we have photo frames, and special wedding candles. Our selection of CHRISTMAS CANDLES is very comprehensive and we also stock christmas tree candles, christmas tree candleholders and advent candles and original swedish angel chimes. Newly available this year are imported Chanukah (Hanukah) candles for our Jewish customers.